If like me you’re bad at remembering dates when you should or shouldn’t be doing things for your hounds health might I suggest the 1st of each month? About 6 weeks ago I last did Freya’s flea treatment, and I couldn’t remember the date I used the flea spot on at all. So I’ve waited until the end of the month so in future knowing the date its due is easy peasy. Today will also be worming tablet day. I know she’s not going to volunteer to eat a tablet so this will go into chunks of meat from our dinner later this evening. She won’t notice it so much then, and it makes those yukky looking tablets a reward, not something to be wary of. Something I’ve found by reading labels and the ingredients section in particular is that cheap pound shop flea spot ons are the same as the more expensive £5 – £10 varieties. Why pay more? Its not that I’m tight but I would rather save a few pounds and get her a treat with the change. If there really was a difference between the ingredients and performance of them I would buy the option that suits Freya best, not my wallet. 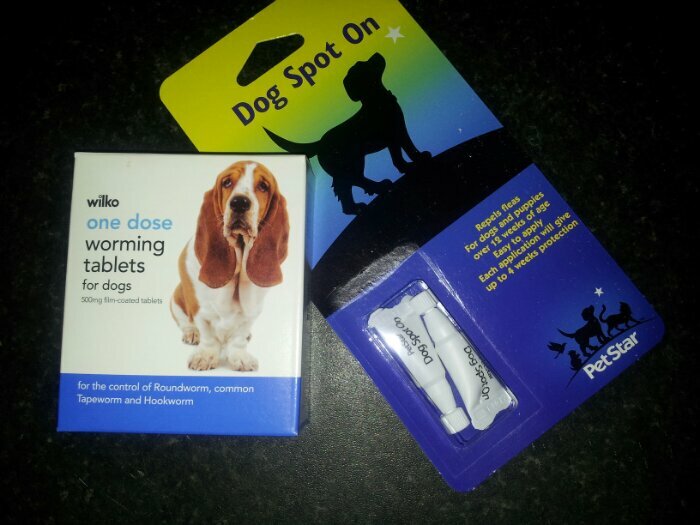 But £1 for a two pack makes it 50p a month to get fleas off your doggy. What a deal. As for worming tablets, we use Wilkos own brand. Not a quid a box, more like a fiver but for a woof of Freya’s weight its 2 doses per box. We treat her monthly, as my vet advised us to do this, as we have children. Worms are nasty sods, its not just that they can feel unpleasant and mean your dog needs to eat more, the real problem is worms can carry diseases dangerous to people and dogs. Other dogs I believe are every 3 to 6 months, but always read the label on your brand, if in doubt ask your vet. My point is though, we spend £3 a month to keep our Woofer safe from common parasites, and I’ve heard dog owners before saying they skip these basic preventative treatments as its too expensive. Well its not if you shop smart. This is not a sponsored post at all, I just wanted to share my advice, in case my thifty shopping helps any other dog lovers. Stella has a flea tablet monthly, more expensive but she rolls around in so much **** I just wasn’t confident about the spot on stuff having a chance to work. Having said that, didn’t ever notice any fleas so I might just be paranoid! She has a worming tablet every 3 months, a while back I found chewy beef flavoured ones but they don’t make them anymore so like you, her pills get crushed with her dinner! Lisa from Lisa’s Life recently wrote… Play: a poem..
Didn’t crush them, just stirred them into the meat so was hidden from view, & stuck a few dog biscuits in so the crunch didn’t seem wrong. Something to think about, thanks for the heads up! Lauranne recently wrote… He’s so full of …it!. This is a helpful tip. I have to set reminders for everything else it gets missed. We have indoor cats so I don’t really deflea them as there’s not any way they could get infected. We’re getting a puppy soon so we’ll need to get in a routine with it. Just want to say, when puppy starts going outside the house cats will need treating too. Be warned though, dog spot-on flea treatments can kill cats, so try to keep them separate as it dries. Thank you for sharing. I also like wrapping dog tablets with meat because my dog will never eat a tablet by its self. Luckily his flea control and heartworms are meat flavored. I make sure to apply Advocate on my dogs every other month. Brian Bishop recently wrote… Best Pet Supplies Voyager Mesh Harness Review.